Warmest welcome to Restaurant Story! We are delighted to have you joining our community. Come and join in our chats and discussions with fellow players. Please feel free to ask if you have any questions. Enjoy yourself and happy cooking! Post any question you have regarding the game in Restaurant Story: Help Me I have a Question. Post a picture of your restaurant and see community restaurants in Show off your restaurant. Post in Restaurant Story | Bugs & Issues forum. Last edited by Rynetory2; 05-16-18 at 12:15 AM. Since we have some great reference threads, but we need to try and keep the number of stickies down on this forum, here is a Guide for easy access. If you have questions or need to add information, please send a Private message to a Moderator. There are several important aspects to running a successful restaurant: Cooking Food, Serving Food, Keeping Customers Happy, and Customizing your restaurant. Step 1: find an empty oven and tap on it twice to open the cookbook. Step 2: find the dish you would like to cook and tap on it to select it. Step 3: prepare your dish by tapping on it to prepare or add the dish's various ingredients - once you have finished this step you will need to wait for your dish to finish cooking to continue. Once your food is on a serving counter (as explained in the final step of Cooking Food), it will be served to customers automatically as they find empty seats in your bakery. If you don't have any available serving tables then you need to either a) buy more from the store, b) remove food from existing serving tables by tapping on it and choosing remove, or c) wait for your customers to eat all of the food off of one serving table. Please note that identical food types will INITIALLY take up two serving counters, but if your serving counters are becoming full then your chef will combine your identical dishes to make room for new food. You can keep your customers happy by having empty seats for them to sit in and prepared food for them to eat. If there is no room for a customer to sit, then they will eventually become frustrated and leave the restaurant. If there is no food for them to eat, then they will eventually become frustrated and leave the restaurant. Make sure to have plenty of food and plenty of seats and tables waiting for potential customers - remember that happy customers will attract even more customers and that's just what you want! You can customize your restaurant in any way that you like - it can be strictly functional with only tables, chairs, ovens, and serving counters, it can be purely decorative with no functional items, or it can be anywhere in between. To find items to place in your restaurant, open the store by tapping on the hammer in the lower right corner of the main screen. Once the store is open you can browse the various categories and choose items in each to purchase and place in your store. To purchase an item you can either tap on it and tap again at the location you'd like to place it or drag it to where you want to place it and tap again to confirm. Last edited by Rynetory2; 04-23-17 at 06:07 AM. The Collectibles feature has been a favorite since it was instituted, but we get a lot of questions about it as well. With that in mind, we?ve composed a guide that will help you all understand how this new feature works. Currently, the Collectible feature is only available on iOS devices, but this guide can still be helpful for Android players to prepare you for this feature. Check below the jump for more details! Collectibles are items that you collect for performing various actions in the game. There is a random chance for a collectible to drop while performing certain actions. Where can I view my Collectibles? When you receive a Collectible, it is stored until you have all of the required Collectibles to redeem the reward. You can view your current Collectibles and other information by viewing your collection from the Main Menu > Collectibles tab. There are a number of Collections available for each game. Each Collection will require you to collect 4 specific Collectibles in order to redeem the reward. Each Collectible has a different drop rate, which means some Collectibles are harder to obtain than others. How do Mastery Levels work? Each time you redeem a reward, you are mastering the Collection. If you keep redeeming the rewards, you will eventually gain a Mastery Level and receive different bonuses! Each Collection has 4 Mastery Levels. 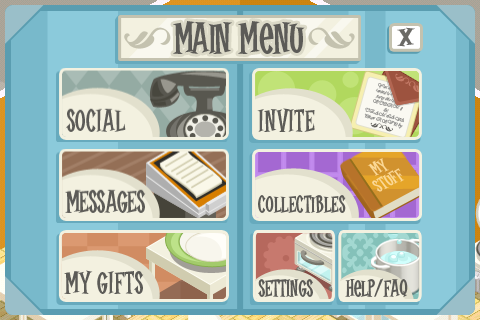 What Collections are in Restaurant Story? 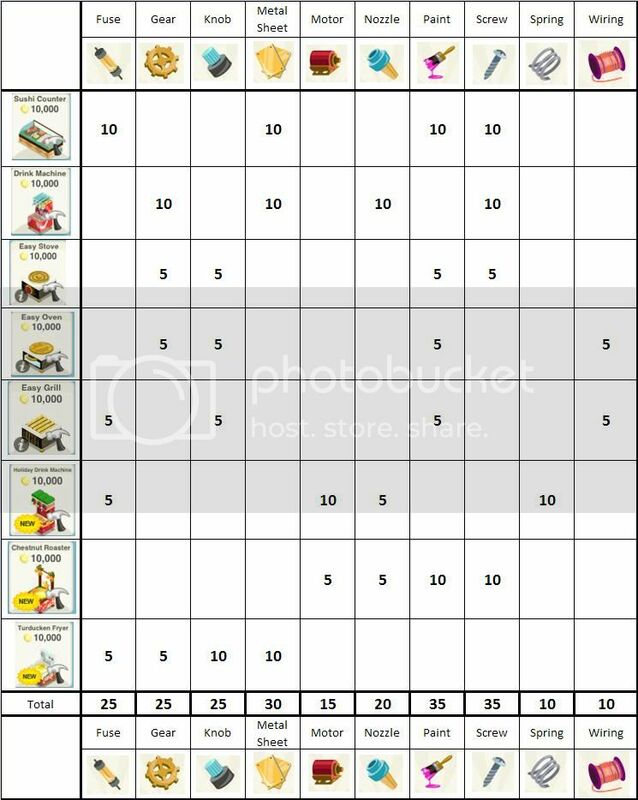 There are 6 different Collections for Restaurant Story and each one has a different reward. We?re going to give you some tips on how to find the different Collectibles for each Collection! Tip: Randomly drops when purchasing Wall Decorations or Wallpaper. 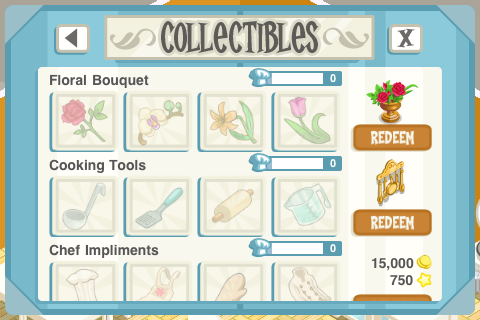 Tip: Randomly drops when purchasing any of the following items: Tables, Chairs, Decorations, Appliances, and Counters. Tip: Randomly drops while cooking ANY recipe in Restaurant Story. Tip: Randomly drops while cooking ANY Breakfast or Dessert recipe. Tip: Randomly drops while cooking ANY Lunch or Dinner recipe. Tip: Randomly drops when you purchase an Open Mic, Espresso Bar, Pastry Case, or Bean Bag. Stay tuned to the blog, we'll be providing Collectible guides for the other games in the future! Last edited by Rynetory2; 04-21-17 at 10:00 PM. Last edited by Rynetory2; 05-06-17 at 08:53 AM. Last edited by Rynetory2; 08-15-18 at 05:11 AM. moratorro was kind enough to create this wonderful post on the Easy Appliances. This also applies to the Drink Machines and Sushi Bars! First of all I want to say that I wrote this guide only from personal testing I made last days. Ok, let's have a look to easy appliances and how they work. First of all, they are easy because they need only one tap to start cooking food, and one tap to serve it on the counters. In other words they just cut down tapping time, but NOT the cooking time: it's still the same. You have to buy one of them (stove, oven or grill), and it will cost 10.000 coins. You can see that it needs 20 parts to complete. 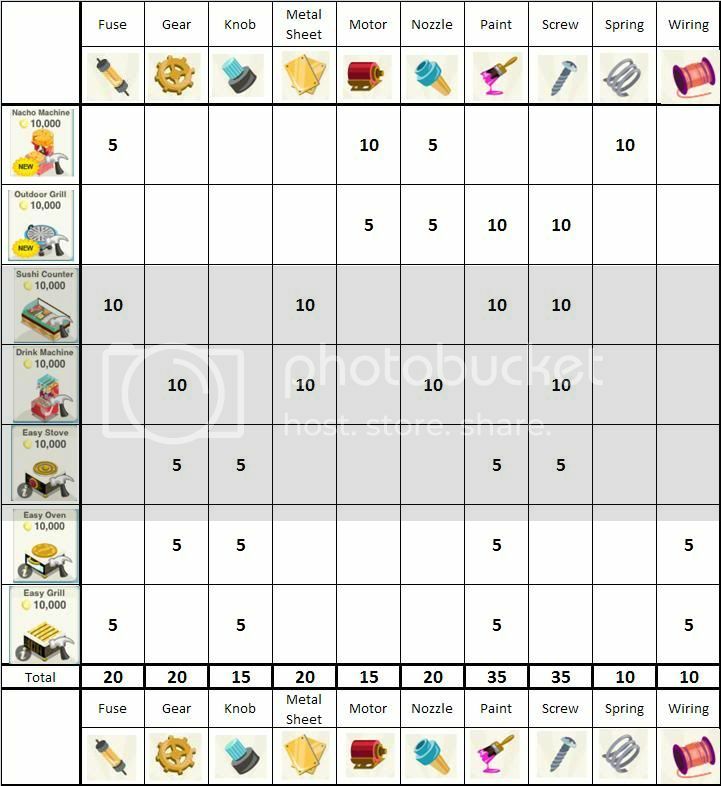 You can FREE ask for these parts to your neighbors, or you can buy them with gems: every part will cost 2 gems, so it comes to a total of 40 gems. If you got parts from neighbors before buying the easy appliance, you'll find them already inside, just like the paint above. You can tick your neighbors to request parts from them (I deleted names from the picture) and then press Send. You can ask only one part to every neighbor once a day. When your neighbors accept your request all the parts will go straight in the box. But if your neighbors will gift you with parts, by pressing the "Gift" button, you will get them in the "News feed" list, just like the other food gifts. So you have to accept them, as you do with food. So all you need is to tap "Build it!" button and that's all! Here is you brand new easy appliance! Now I'm going to point out to you some things I learned by carrying out some tests by myself. - Food gifts and parts gifts are separate (with the exception I'll explain later). 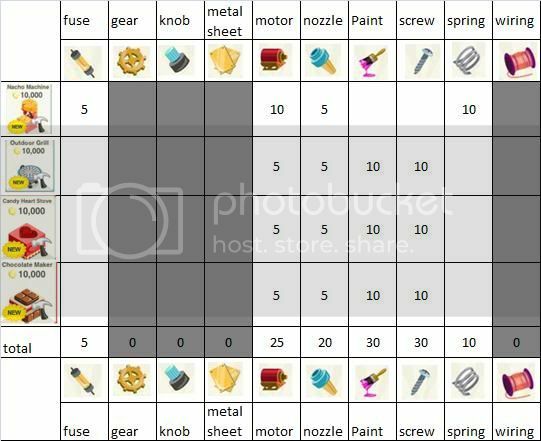 - You can receive max 20 parts a day. - If you send a part to a neighbor of yours (by tapping "accept" button) you cannot send him other parts until next day. But after all he can send to you only one part request on that day. - Part request coming from your neigbors will pop up in News Feed list. You only have to click on "Accept" and parts will be send to them. - When you receive a part from your neighbors (not your request, but a real gift like food) you have to press "Accept", just like food, and it will pop up that: "You can find it by going to "My Gifts" from the main menu". This NOT true: in My Gift list you'll find only gift food, while parts will go straight in the box you are building. - I'm sure about this: part gifting and part requesting is totally free, neither coins nor gems. - If you are NOT building an easy appliance and you receive gift parts, you can accept them: these parts will wait "somewhere" until you will actually get an easy appliance, and you'll find them already inside the box. I said before that food gifts and parts gifts are separate This is true only for parts that are actually requested from neighbors. Let's make an example. Your friend Groupmagma (!) is building an easy oven and he sends you a request for one Gear. You click "Accept" and a gear will be sent to him and it will go straight in his easy oven. This part will not interfere with your normal gifting for that day. As a matter of fact you can still gift him by pressing the Gift button, and you can choose to gift him with another part (INSTEAD of food): this second part will pop up in his "Gift list" together with other food gifts Groupmagma received on that day. I hope this post may help you. If you have other informations or news about easy appliances feel free to add one post here so that everyone can read it. Please add only news you actually tested by yourself, not only things like "Parts gifting is gem decreasing!" (this is definitely not true). Thanks to all my amazing neighbors for their support and their parts and food gifting! Edit: a few additional pieces of information. 1. When trying to purchase any of the appliances (including the drink machine), it helps to tap on the top part, away from the hammer. 2. After placing it, it's best to tap the very bottom of the box to gain access to it. 3. When trying to access the cardboard box after purchasing, you may need to move it or the items around it to access. If you don't want it sitting by itself the whole time, simply move it, access to check how many parts or send requests out, then place it back where you would like to have it. 4. Chef hats and exp are exactly the same as regular appliances, though they may appear different when you are tapping. Last edited by Rynetory2; 04-21-17 at 10:02 PM. Last edited by Rynetory2; 04-11-18 at 01:26 AM. Last edited by Rynetory2; 04-26-17 at 07:58 PM. Last edited by Rynetory2; 04-26-17 at 07:59 PM.